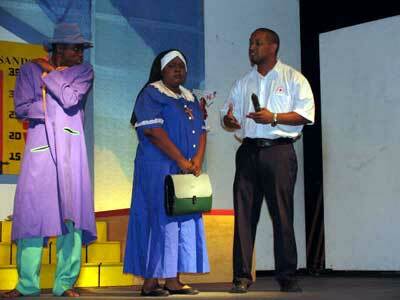 In 2005, Marina Lampkin from the Ministry of Tourism in St. Vincent saw the first run of POSITIVE at the Barn Theatre in Jamaica. She was convinced that the production with its credible, powerful and hard-hitting message about HIV prevention should be performed in St. Vincent. After three years, director fabian thomas and a new cast of seven actors from Jamaica entertained and educated audiences in St. Vincent and the Grenadines on a six-show tour of the island June 9 – 14. The tour was made possible with funding from the World Bank, in collaboration with the Ministries of Finance and Planning and Tourism in St. Vincent and entailed the edutainment musical being performed in the capital (Kingstown), as well as in the communities of Rose Hall and Fancy and the Union Island. Originally planned for five performances a sixth one was added when 70 reservations made by the island’s National Insurance Department could not be accommodated since tickets for the two Kingstown performances ran out the day before both shows. All performances were free to the public. Written by acclaimed Jamaican playwright and screenwriter Trevor Rhone, with lyrics by fabian thomas and Teisha Duncan, music by Grub Cooper, set design by Bob Kerr and movement by fabian thomas, POSITIVE’s adaptability and currency were unequivocally proven by the variety of venues and the response from the varied audiences who came out to watch play. Playing to full houses in all but two of the performances, the cast of Craig Binns, Lee Patience, Brian Johnson, Susie Braham, Dane Richardson, Marsha Campbell and Althea Hewitt performed with vigour, precision and professionalism to resoundingly appreciative laughter, applause and active participation in the Q & A session facilitated by thomas at the end of each performance. In his comments after one of the three Kingstown performances, Tourism Minister Gen Beache, said he was very impressed with the production, happy that so many turned out to attend but disappointed that more youth were not in the audience. He went on to say that he felt thomas and the cast should be invited back to do a school tour. This was met with thunderous applause. POSITIVE tells the story of HIV educator Joe, who decides to take his message to the mall in the form of a “walk and talk”. It shows the people he meets the issues and challenges to HIV prevention, as well as Joe’s own personal challenge. Rhone’s masterful script is flavoured with eight original songs and contemporary movement, making POSITIVE a must-see. Thomas plans to seek sponsorship to fund an extended run of the production in Jamaica, and a special performance for World AIDS Day on December 1. So far there have been expressions of interest from Barbados for a tour similar to the ground-breaking one in St. Vincent.